Anyone who visits Spain's Seville region is bound to come back enchanted; with its ancient heritage that has spawned numerous structures of breathtaking beauty, the warm and effusive locals and that golden-yellow sunlight that barely leaves the city, this is a mesmerising city. So you can only imagine how our ears pricked up when we heard of a home in the city that embodies its unique and colourful spirit! This fairly large house has been built on two levels and had one brief prior to its construction: a bright, airy and organic space. And that's indeed what you get. Stack on two interior courtyards to that! The decor scheme is kept modern and minimal with pops of colour that make the space appear cosy and inviting. 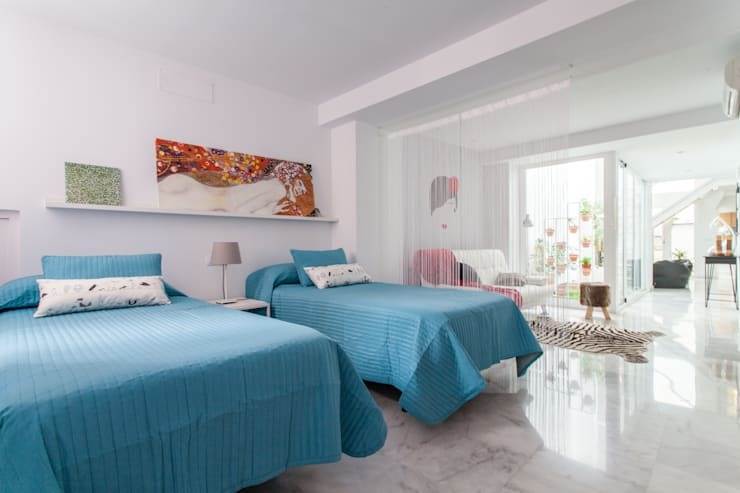 When you Iive in a sun-drenched city like Seville, you make sure that your home too gets the most of it, and here every opportunity has been taken to ensure that the house gets tons of natural light. Right away, we can see how the designers have incorporated an open-plan layout, not just on one level but by keeping the break between the levels very subtle. The floating stairs with the white railing and transparent balustrade keep things lightweight and airy. Meanwhile, the large glass panels (which opens out onto the interior courtyard) allow the exterior to come inside, making the space appear even larger. The decor is contemporary and colourful, a mix of boutique store and antique finds. 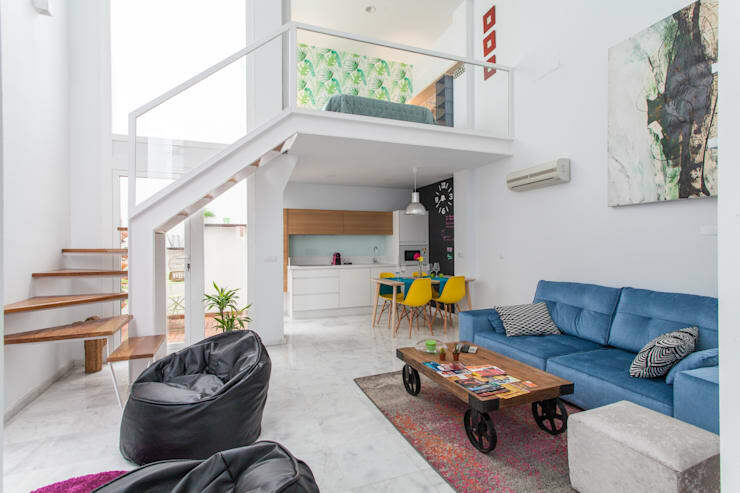 The blue couch and the colourful carpets and rugs instantly imbue the space with playfulness. Seemingly small details give this modern kitchen tons of character. 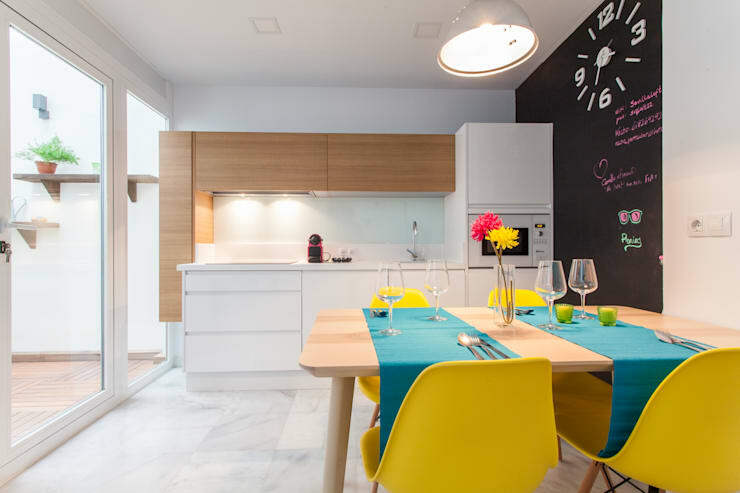 The white and light wood kitchen cabinets play off beautifully against those bright yellow chairs and blue table runners. These in turn are further highlighted by the chalkboard wall where you can let out your inner Van Gogh… or child. Like the living area, the kitchen too gets ample light. Since the owners wanted to minimise clutter and preferred that colours do the talking rather than accessories, the kitchen itself is kept minimal; everything is neatly integrated here. Compared to the rest of the spaces, the bathroom is not a large one but the designers have made optimal use of it. 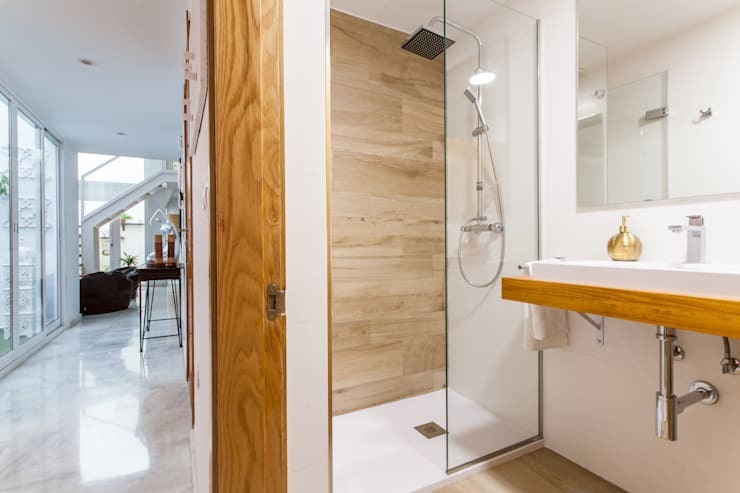 This is the only place where the design scheme is given a slight variation; instead of the marble floors seen elsewhere, the bathroom has light wooden floors as well as one wooden wall in the shower stall. In small bathroom spaces such as these, it is generally a good idea to keep the shower door transparent as it visually minimises the breaking up of the area. In any case, a rainwater shower head ensures that you are completely oblivious to how small the space is. This gorgeous guest bedroom is spacious and looks even more so thanks to the lack of any doors separating it from the living area. Opting out of doors to separate the bedroom in small spaces is a common design trick but here, the designers go one step further; in place of standard curtains, there are white curtain strips that give the space an even dreamier quality. There are no boxed-in elements here. Even the storage cupboard (to the right of the frame) consists of wooden panels that are kept open. Incidentally, if you want your space to look as gorgeous as this in pictures, we suggest you check out the photographer who clicked these. This ridiculously chic corner could have been straight out of Vogue magazine! An extension of the living room, this little nook houses a designer sofa with intimate views of the internal courtyard. 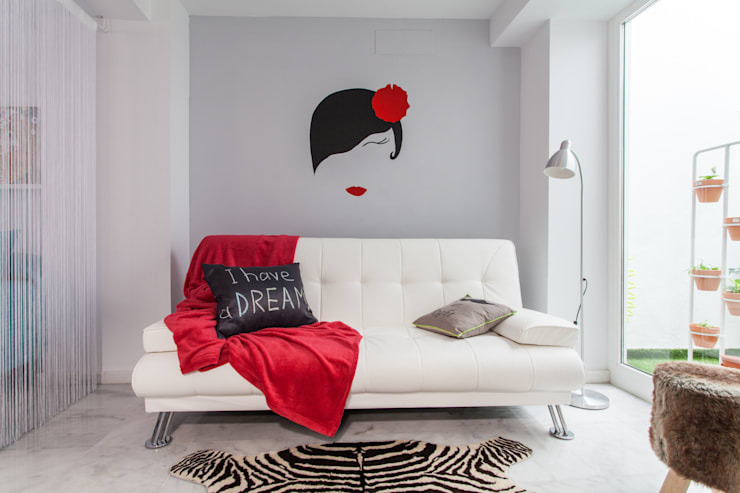 The bursts of colour here, whether it's the red throw blanket, the cowhide rug or that demure vinyl wall art, all come together to make this a perfect space to spend your downtime, reading a book or having coffee. And one that has oodles of personality too! Check out another gorgeous, stylish home: A vintage-style apartment to steal your heart. What did you think of this bright and sunny home?